The “Bento Announcer”! ?, Katō Taihei, and the show that has left the Queen speechless! T/N: During his college days, Katō—not to be confused with the skier with a similar name (different kanji)—was known for his aggressive and dynamic plays as a forward in the Waseda University soccer team, the Inaho Kickers. Following graduation, he has worked on the announcing team at TV Asahi. He’s known as the “Bento Announcer” amongst fans because he often tweets about the boxed lunches he eats in the course of his work. This interview was part of the “Sports News!” broadsheet that came with the January 2017 issue of Newtype. Meet the announcer Katō Taihei, who has achieved great success doing live commentary (play-by-play and analysis). The design of the announcer he plays, Morooka, also seems to be based on Katō himself, complete with his cheerful and refreshing personality. —As we plunge into the Grand Prix Series and watch the performances of the skaters one after another, I suddenly realised that each of them was graced by your voice, in ‘live commentary’ mode. Katō: The other day, Toyonaga (Toshiyuki)-san took a little playful jab at me, like “It feels you’re the one who has the most lines, don’t you think?” (chuckles). 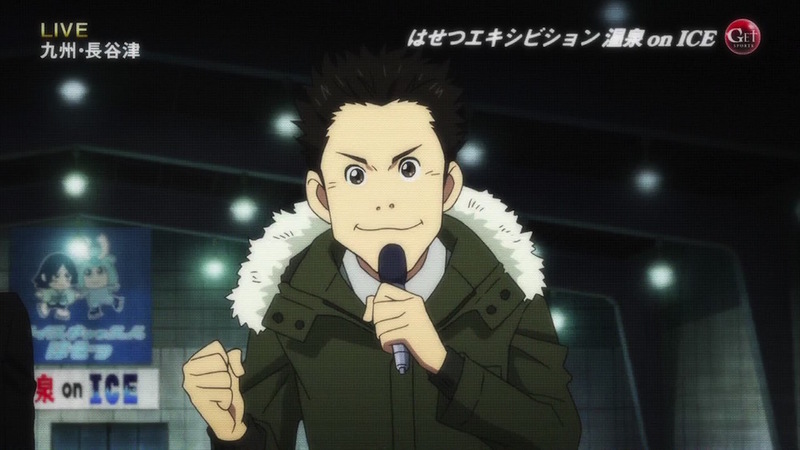 I’ve been an announcer for figure skating ever since I worked as a reporter at the 2007 Cup of China, so I was happy just being part of this anime. To be given this much to do—it truly is something that I’m grateful for. —This is the first time that you’ve taken on the challenge of doing voice-overs for an anime—how did you find the experience? Katō: I still haven’t gotten used to the recording style, so I’m just doing my utmost trying to keep up. In terms of live commentary, I’m not really conscious of the fact that it’s an anime. Rather, I endeavour to just go about it as I normally would. I have them play the music as loudly as it would be played at a real competition, so as to help create the atmosphere of being there, and change my tone in accordance with the tune as I am doing the live commentary. —Do you also propose ideas for lines, like “this is what figure skating play-by-play commentators would say”? Katō: Yes. There are many rule-like guidelines, such as when the competition starts, we don’t say “Competitor ~~” but just use their full name or first name, or the differences between what the ‘play-by-play’ commentator and the ‘analyst’ commentator say. For the most part, we leave the names of jumps like the “triple axel” to the analyst, whilst the play-by-play commentator will say things like “He did it!” but I don’t think that’s something that viewers really pay attention to. So that was something that the writers had mixed up a little, and I helped them fine-tune it. —From your own perspective, what would you say is the main draw of this show? Katō: Well, I’d have to say it’s the competition scenes. They really surprised me. The pattern and technique of each jump is incredibly realistic, and I couldn’t believe they’d go so far with the spins as well… They’re not just beautiful to look at, you can also see that they’ve captured on the screen a spin designed to maximise the points that the skater gets. So I think this is a show that would satisfy even figure skating fans. —Speaking of which, even Evgenia Medvedeva, who was crowned world champion in her senior debut last season, likes the show. At Skate Canada, you presented her with a Yuri!!! on ICE clear file, and that was reported all over the news. Katō: That may look as though I was acting on instructions from the anime staff, but in truth, that clear file alone is something I prepared by myself. I knew that she’d been watching Yuri!! !, so I figure that I just had to give her something, and took the opportunity to pass it to her after she’d skated. And when I gave it to her, she was completely taken aback and simply ecstatic (chuckles). Her reaction just showed how much she loves it, which made me happy, and it also made me realise all over again just how global this anime is. —And another key point is that the show goes into the emotions of the skaters as they are performing. Katō: Right. What they think about as they are skating is something that we’re all curious about, huh? I actually asked a certain skater about that some time ago—in their case, it was like “If I miss this jump, then I won’t make it onto the podium,” and then they’d keep counting their points as they skate. But that’s something that we have no way of knowing, right? In the anime, they can monologue that as they are skating, so it really gives it a fresh slant. Like, those scenes with the siscon Michele Crispino (chuckles). The way the commentary was juxtaposed with the cries from his heart was incredibly interesting. —And now, the story has run through the Grand Prix series, and we’re finally plunging into the Final. Katō: Fans of Yuri!!! probably all have their own favourites, whom they cheer for regardless of nationality. Whether or not their favs ended up going to Final, I suspect that they were all probably quite tense watching them skate. That’s precisely where the charm of figure skating lies. It’s not like we’re cheering them on just because they’re one of our own. And so, I hope that all the viewers who become interested in figure skating because of this show enjoy the real Grand Prix Final from that same perspective. The Final really is an insane experience. Skaters with a charm no less intense than those on the anime have competed ruthlessly to reach it, after all. I will also be at this year’s GPF, as a reporter, so I’d be really happy if fans would watch it alongside Yuri!!! as well.